Premium Quality Hand Scraped Ash Replacement Stair Tread. Quote and order any size online! Fill in the dimensions below and options below. The stair treads on this page are 3/4" thick with a 1" thick bullnose, available up to 29" wide and 120" long. Ash varies in color from light blond to nearly white and the heartwood varies from darker tans to browns. Hand scraped wood stair treads, also know as distressed wood stair treads, have a rustic look that is hard to match. Our skilled craftsmen scrape each tread by hand. Hand scraped wood stair treads offer an old world look that will add beauty and value to any home. We offer two nose choices: square edged and full bullnose. Please select your choice below. Square edged is the more popular choice for hand scraped wood stair treads. Square edged hand scraped stair treads will be scraped on the face, the top and bottom edge of the nose, and a little on the nose itself. If a return is ordered, the return will be scraped in a similar way. For hand scraped stair treads with a full bullnose, only the face will be scraped. Replacement stair treads, also know as retro fit stair treads, are designed to fit over your existing stair case, usually replacing carpet. 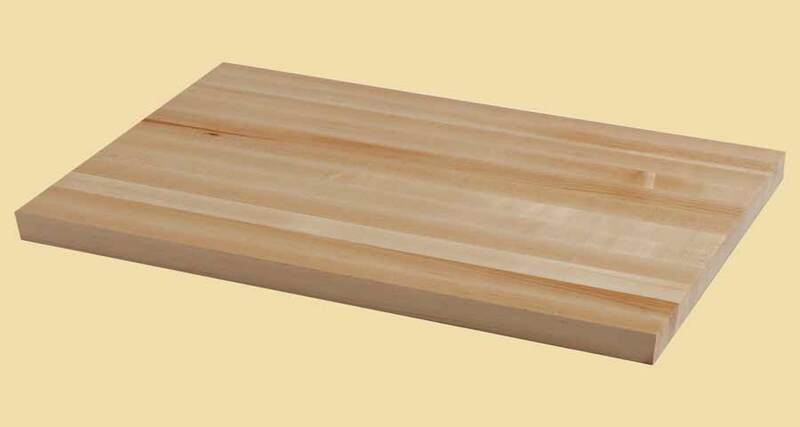 Our replacement Ash wood stair treads are 3/4" thick, with a 1" thick bullnose. The bullnose is made by gluing a thin board to the bottom front of the 3/4" thick tread and then rounding the front of the entire 1" section. The bullnose is 1" thick and 1-1/4" deep. The wood tread is constructed by edge gluing boards together side by side. All of our stair treads are made from top quality hardwoods. Our wood stair treads are not engineered and do not have a veneer. Only FAS and Select grade lumber are used. 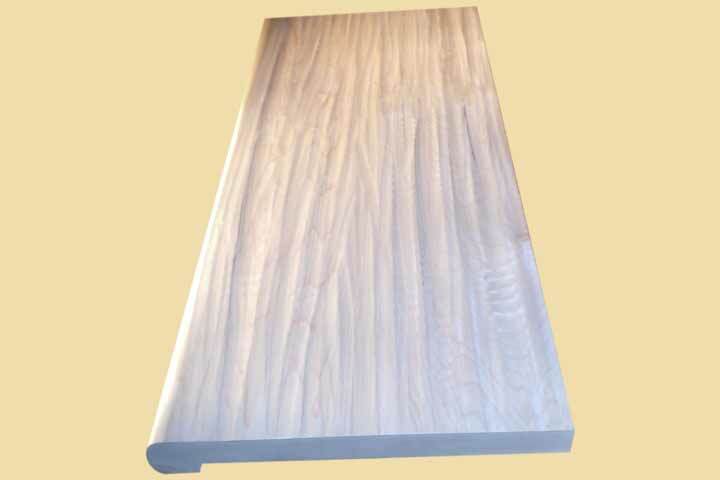 Your replacement Ash wood stair tread will be manufactured slowly and carefully. The result is a premium quality hardwood stair tread, adding beauty to any home. 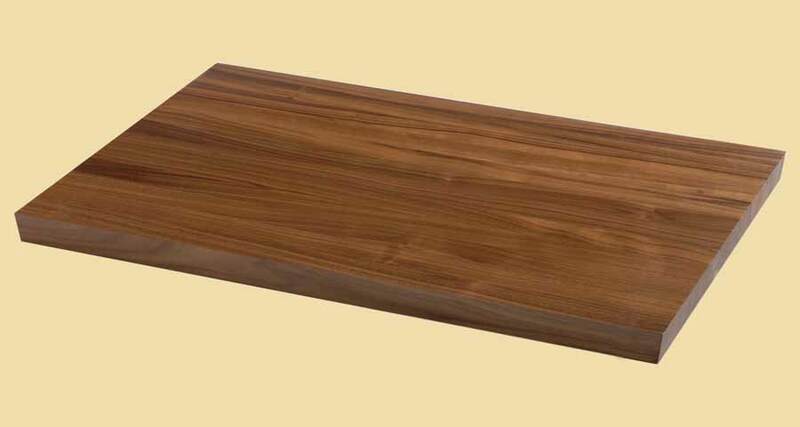 All replacement Ash wood stair treads are custom made and will ship within two weeks. If the stair tread will be visible on the side, order a return. A return is a separate piece attached to the side of the tread. Returns should be ordered from the perspective of walking up the stairs. The ordered dimensions always reflect the overall dimensions, including the bullnose and any returns. Note: A return does not affect the overall length of the tread. Our returns are 1-1/4" wide. If you are measuring throat size, add 1-1/4" for each side that has a return. The treads listed below are 3/4" thick with a 1" bullnose. These hand scraped treads will ship slightly over length. The only exception is double return treads which ship at exact length. Note: The image in this listing is only meant to show the handscraping. It does not represent the actual wood you will receive. The Ash replacement stair treads on this page are sold unfinished. These treads are 3/4" thick with a 1" thick bullnose. Dimensions: 3/4" x 10-1/2" x 36"